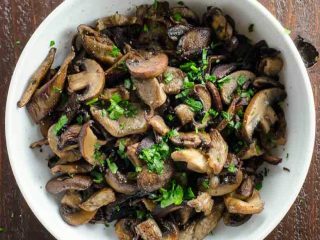 Sautéed mushrooms are such a fabulous no-brainer of a side dish that we neglected to include the recipe here for a good nine years. Not cool, Umami Girl. 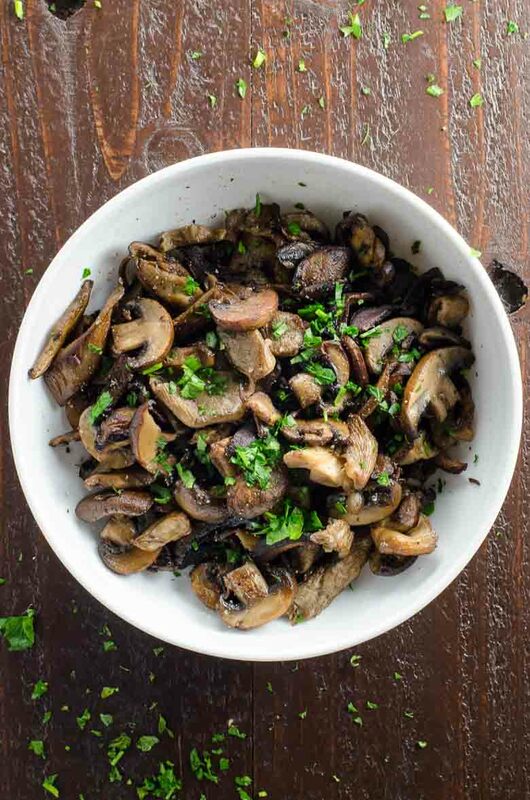 It's time we shared the best, most savory sautéed mushrooms recipe we know. Serve them alongside virtually anything, but especially Eggs Florentine, Carluccio's London style. A large cast iron skillet will help you brown the mushrooms easily, rather than risk steaming them in a smaller or less heat-retaining pan. 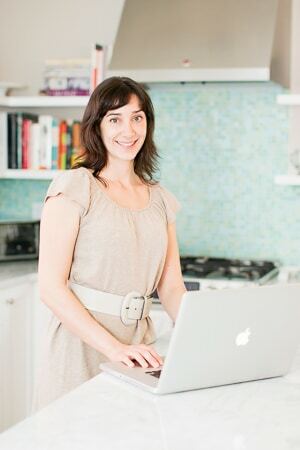 I joked on Twitter a while back that although the Umami Girl recipe index has lots of categories, it really only needs two: HAZ MUSHROOMS and DESSERTS. It’s funny ’cause it’s true, people. Still, somehow the simplest, most mushroomy dish of all — a good old sautéed mushrooms recipe, cooked to perfection with a few simple tactics — made it nine years without an appearance. Last week I posted our favorite London brunch from Carluccio’s — Eggs Florentine. Every Saturday I ordered mine with a side of the best sautéed mushrooms. This is the version of that bliss that I like to make at home. The best advice for storing mushroom is: don’t. Or at least, don’t store them for any longer than you have to. They perish quickly. That said, of course you’ll need to store mushrooms sometimes. Here’s what to do. If you’ve bought mushrooms in supermarket packaging, leave them in that packaging and place them in the fridge. Those containers are designed to promote the right amount of air flow to keep mushrooms fresh as long as possible. If you have loose mushrooms, place them into a gallon-size zip-top bag, leave the bag open, and place it in the fridge. This may not be what you’ve heard before, but trust us. It works. Don’t wash mushrooms until immediately before you use them. And make sure to use them within a few days. There’s a lot of mythology out there about how to clean mushrooms. Here’s the real deal. If your mushrooms are whole and you plan to cook them, it’s okay to rinse them in water — just don’t leave them to soak. Brush off any large bits of soil and debris with a dry paper towel or a mushroom brush. Then place whole mushrooms in a colander (or better yet, a salad spinner), give them a quick but thorough rinse. Dry with paper towels. If your mushrooms are sliced, don’t wash them in water. The inside surfaces of mushrooms are spongelike and will absorb a ton of water, leaving them bloated. Most pre-sliced mushrooms are pretty clean, so just brush off any remaining soil and debris with a dry paper towel or mushroom brush. If you’ll be serving mushrooms raw, don’t wash them in water even if they’re whole, because the water will darken them and make them less appealing. Just brush them off with a dry paper towel or mushroom brush. 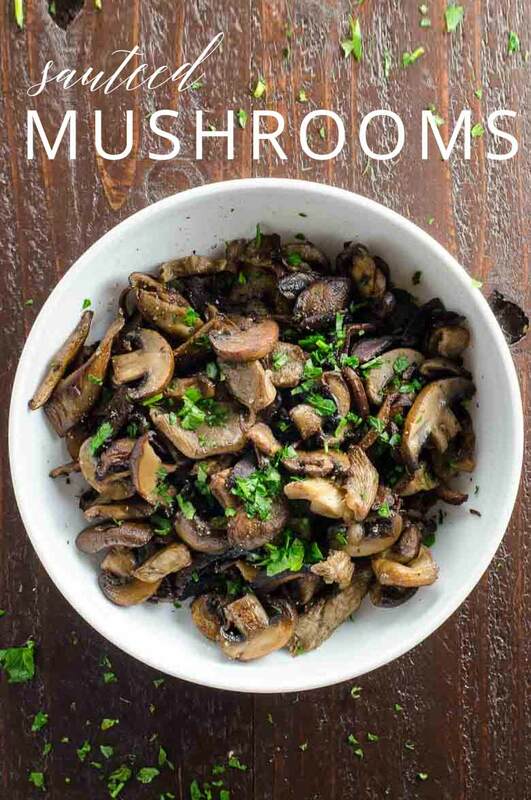 You can make a sautéed success out of any type or combination of mushrooms, from good old cultivated white supermarket mushrooms to a mix of fancy wild specimens. I first fell madly in love with sautéed mushrooms in the 1980s, when white button mushrooms were the only available kind. These days we tend to go a little crazier. White button mushrooms give off the most moisture by far, but our cooking method ensures that the water cooks off quickly and lets mushrooms brown beautifully. Cremini (baby bella) mushrooms and shiitakes are flavorful, low-moisture cultivated mushrooms. (Shiitakes are often called wild mushrooms, but these days most of them are cultivated.) We rely heavily on these two powerhouses in our typical sautée. They’re widely available and easy to work with. If you like, it’s fun to add some true wild mushrooms to the mix. Oyster mushrooms are a great entry-level wild mushroom and make a good addition to the cremini-shiitake mix. Use a heavy, heat-retaining pan, ideally a 12-inch cast-iron pan if you have one. Cast iron retains heat beautifully and evenly, making it easy to brown mushrooms on the outside while keeping them nice and tender on the inside. High heat is your friend. End of story. Use really good butter. Kerrygold salted butter is my favorite due to its pretty much unequalled combination of quality, fair price, and availability. (Not sponsored — just fangirling.) Good butter means cultured butter made with cream from grass-fed cows. It should be a beautiful yellow color, not anemic-looking. And it should taste really, really good. Don’t shy away from the salt. Mushrooms love it. They're also high in potassium, which helps your bod justify sodium. That's the technical analysis, okay? 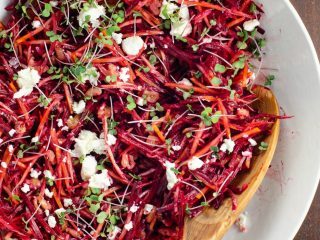 Simple and simply fabulous, this favorite side dish is a no-brainer. For best results, use a 12-inch cast iron skillet. Preheat a 12-inch cast iron skillet on the stovetop for five minutes over high heat. Meanwhile, wipe any dirt off the mushrooms with a paper towel and, if you like (and your mushrooms are whole), rinse under running water and spin dry. Remove stems from shiitakes and oyster mushrooms and trim a slice of the stem end off the baby bellas. Slice baby bellas and shiitakes about 1/4-inch thick and cut oyster mushrooms into small bite-sized pieces. Add butter to pan. When melted and bubbly, add mushrooms and toss to coat. Cook, stirring only occasionally, for about 10 minutes, until well browned in plenty of spots. Stir in salt and pepper to taste and garnish with parsley if you like. Serve with virtually anything, but especially Eggs Florentine, Carluccio's London Style.